Owls are among the most unique of bird species, with the fascinating small beak and wide face which gives it that penetrating look if we are ever fortunate to see one. 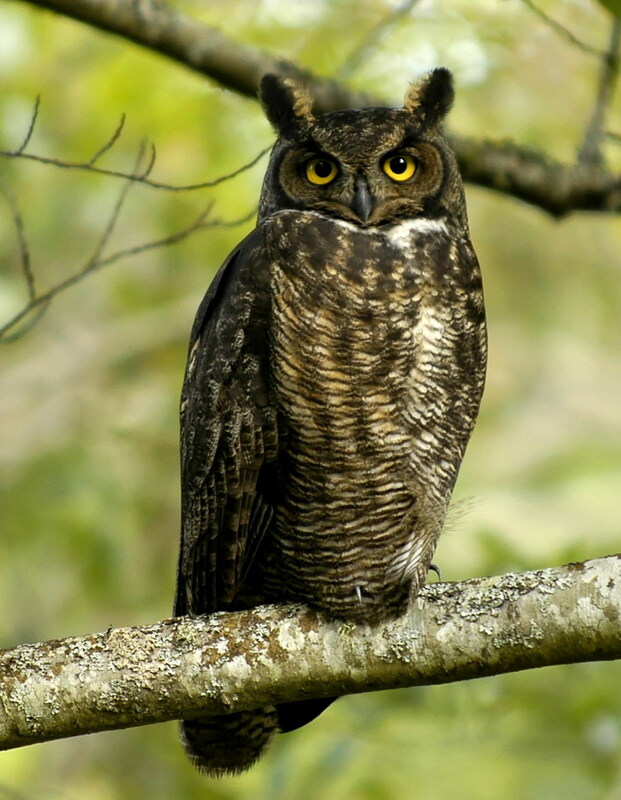 I say that because with a few exceptions, owls are a nocturnal bird which does its hunting at night. 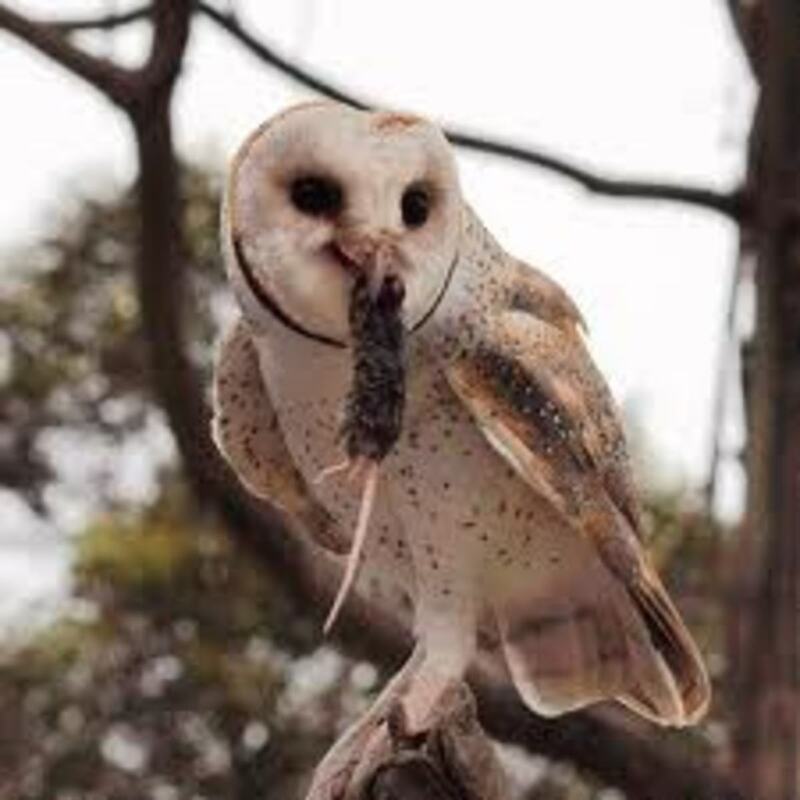 There are two families of owls, the barn owl, which is called Tytonidea and typical owls, which are identified as Strigidae. 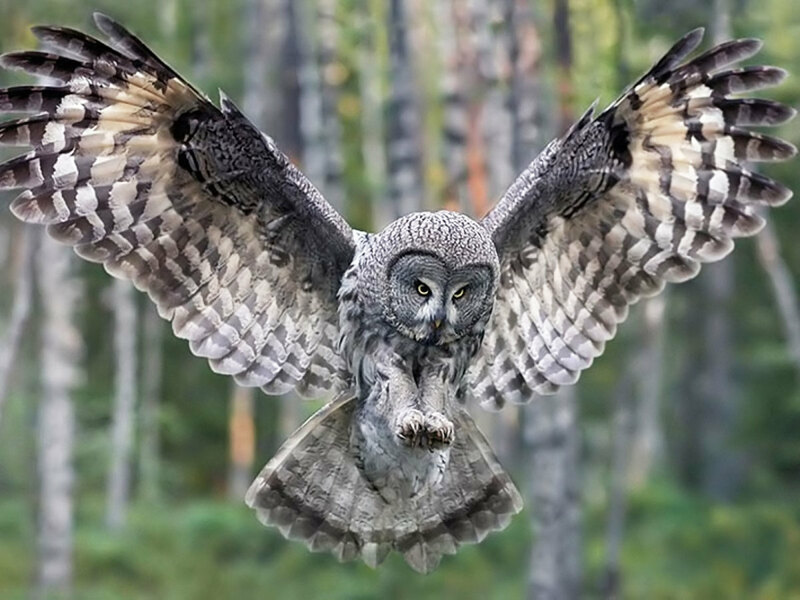 We're going to look at some tremendous wallpapers of owls in flight, with most of them capturing the bird as they are about to land or grab something, which positions their wings, bodies and talons in a way that creates a fantastic image. 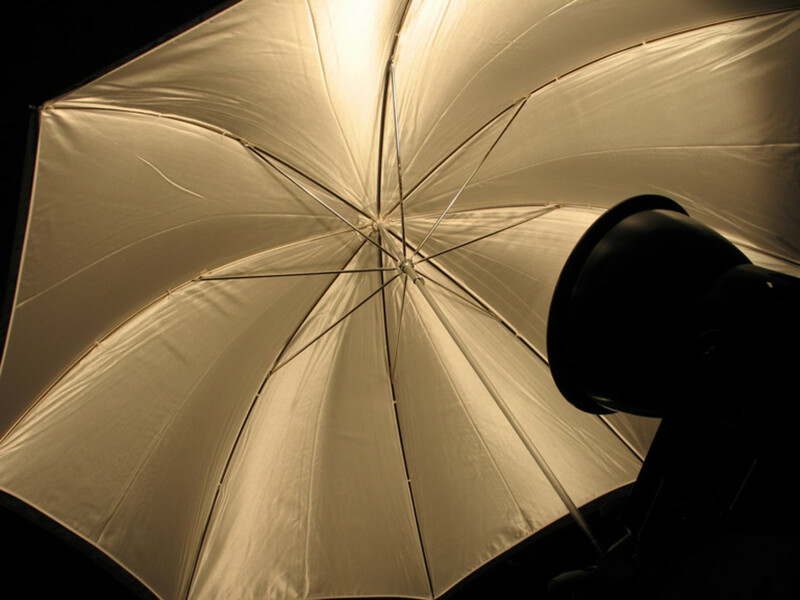 There are several different types of owls in the photo gallery in order to provide options for those who may prefer a certain type of look for a wallpaper. It won't matter which owl wallpaper you choose though, as they all look great and will provide amazing visuals to enjoy throughout the time you're using them. It doesn't get much better than this for someone wanting to see an amazing image of an owl coming in to land or to grab up something to eat. Since this is the day time, it's likely that this owl is flying from one place to another. Whatever it's doing, this owl is an extraordinary creature, and capturing it in flight in this position was an amazing feat. Owls may look funny with those odd-shaped heads, but if you were the prey they were seeking it would be a very frightful experience to see this powerful bird coming in at you. I like wallpapers like this from an inspirational point of view, where qualities such as in this image of the owl like focus and readiness can be thought of, along with admiration for the bird itself. 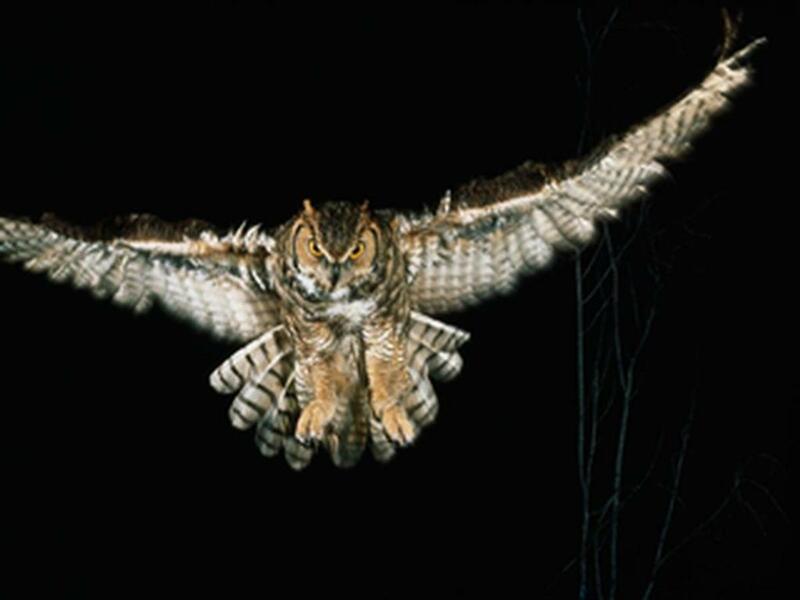 To get a view of what it looks like for an owl to be flying in on a night mission straight at its object, this is a fantastic wallpaper that again shows its laser-like focus. 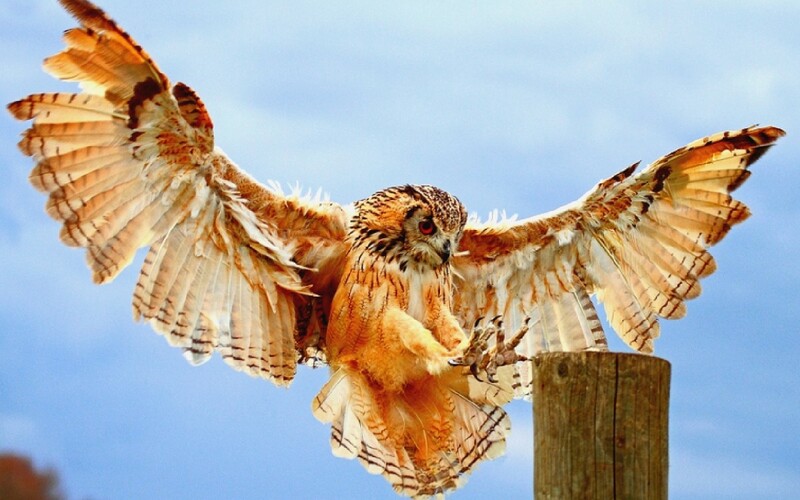 The way the legs of the owl appear to be lazily hanging while in flight looks great, as do the pin feathers behind them which are stretched out almost like a small, upside down male turkey. I really like how the darkness serves as a canvass for the owl, helping to accentuate the terrific detail of the bird. Many owls that are captured in photos are of a similar kind, which results in a look that doesn't have a lot of differentiation coming with it. All of these, including this wonderful Bengal Eagle Owl, are different in kind and looks, and offer opportunities to download several of them and use them off and on when you want a change for your computer or other screens. What is especially compelling about this wallpaper is the inclusion of what it is the owl was looking at and wanting to reach. Seeing it right before it grabs the top of the post to perch on is an extraordinary photo. Also terrific are the beautiful brown hues covering its head, body and wings. No artist could have done it better. Although I can't 100 percent say this barn owl is coming in to grab a quick meal, it's almost certain that's what it's doing from the foliage in the foreground of the photo. It's possible that it is a top of a tree, as evidenced by the pine needles being interspersed by the other plant leaves. But I think it sees something it's about to grab that is on lower ground. Either way, it's an amazing image of a barn owl in flight. What makes it seem even more powerful is the dark clouds behind it. You would think a Hollywood director had created this scene the way it blends together so nicely. As you can see from this stunning wallpaper photo, the snowy owl is a magnificent creature, and seeing it in motion as it's about to land allows us to get a glimpse of all the beauty of the black, detailed lines against its white base. 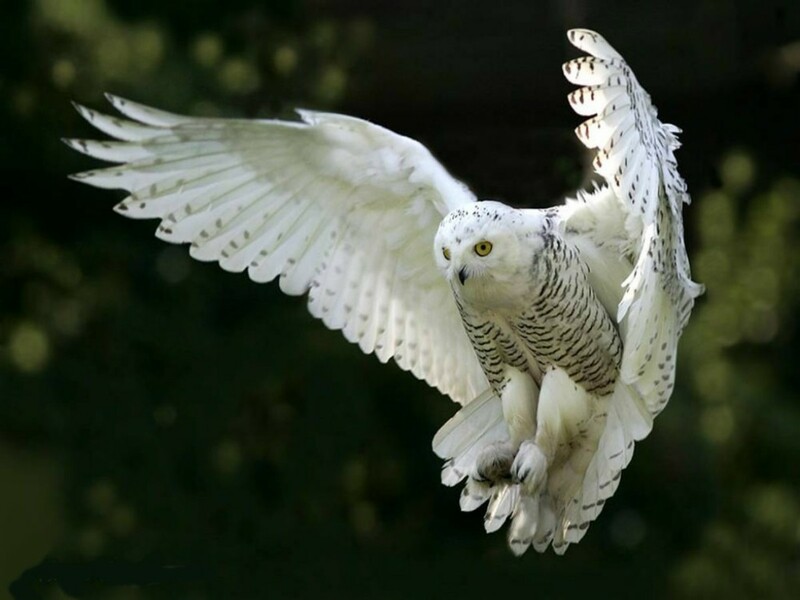 It really looks fantastic because of the lines on the body of the owl which are offset nicely by the white color which is under its wings. When the bird is standing still and the wings down, it has more of a dark, spotted look of dark color on white. You can see that some on the wing to the right as you look at it. This really gives a different look and feel to these extraordinary bird. 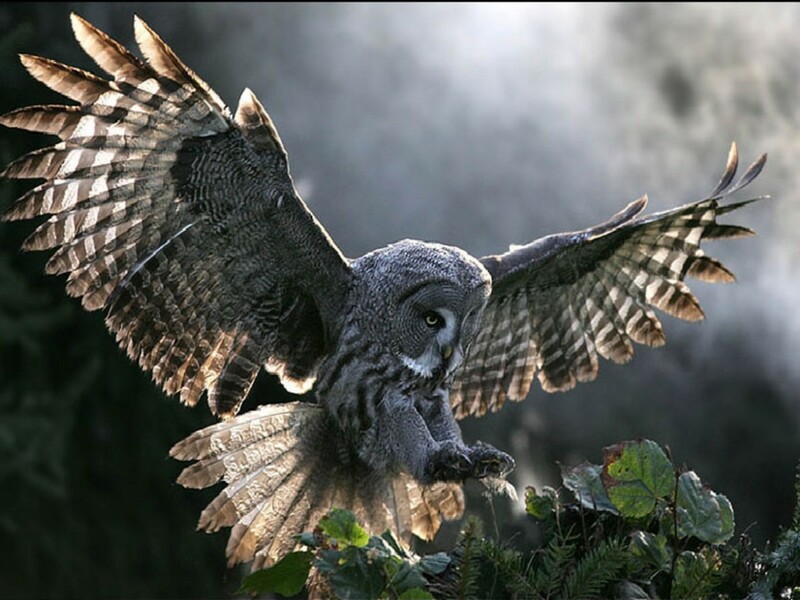 Even though owls look great in a variety of poses or circumstances, to me there's absolutely nothing that comes close to seeing an owl in flight, and especially as they are swooping in to land or grab a little animal or insect to eat. This also lends itself to outstanding photos of the owls because you can see details you wouldn't see if the bird was simply sitting still. Opening those amazing wings in order to slow down and do what it is they're trying to do is the pinnacle of owl images, and these owl wallpapers look terrific, and have a stunning beauty and majesty that can and should be enjoyed.